We are now down the final ten players in Event #4, the $300 NLH Big Stack. The blinds are 25,000/50,000 with a 5,000 ante (Level 28). It folded to Donald Lohr in the small blind who completed to 30,000. Marsel Backa raised to 180,000, and Lohr called. Both players checked the [ad][ac][6c] flop. Lohr led for 125,000, Backa raised to 250,000, and Lohr called. Both players checked the [qs] river. Lohr rivered a straight with [jc][10c]. Backa checked his cards, sighed, and mucked them face down. Someone on the rail said, "He got there, he hit the straight." Lohr replied, "Where was I going? I'm not going anywhere." Lohr is now sitting with 1,600,000 versus Backa's 800,000 in chips. A player in middle position limped in. Action folded to the player in the cutoff who shoved all in. James Dabkowski also shoved all in from the big blind, and the player in middle position folded. The [9d][8d][2c] flop kept Dabkowski's pair of fives in the lead. But the [ad] on the turn would give his opponent a pair of aces. The [3d] river gave Dabkowski a flush and the cutoff was left crippled with only 2,500 behind at 15,000/30,000 blinds (5,000 ante). The player on the button shoved all in and was called by Joe Hertel. 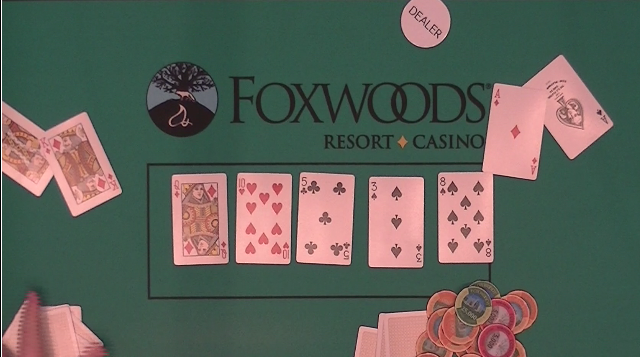 Hertel was in the lead until the flop fell [10s][5c][3s] giving his opponent a set. But that all changed when the [9d] came on the turn giving Hertel the bigger set. The [2s] on the river did not improve his opponent's hand and Hertel would knock him out and chip up to 1,100,000. We are now down to 24 players. We are down to the last three tables in Event 1, Day 2. As a reminder we will either play down to the final table or through level 27, whichever comes first. Peter Wagner raised to 45,000 on the button and the big blind called. The flop came [ac][jd][js] and both players checked. The turn was the [7s] and again, both players checked. When the river came the [5h] the big blind bet 30,000, and Wagner called. The big blind announced that he had a five. Wagner turned over [ks][kh] to take it down with his bigger two pair. Wagner now has 1,200,000 in chips. Event #1, Day 2 has just returned back from dinner break. They are starting level 24 (10,000/20,000 blinds with a 3,000 ante). There are currently 32 players remaining. This event will play down to the final table or a total of four more levels tonight, whichever comes first. Event #4 is currently on their dinner break for fiftenn more minutes. They will return back to Level 21 (5,000/10,000 blinds with a 1,000 ante.) There are 54 players remaining in this tournament and they will play down to a winner tonight. A player in middle position raised to 46,000 and the player on the button smooth called. With action on Charles Saleba in the big blind, he opted to raise to 170,000. The player in the middle position shoved all in, and the button folded his hand. Saleba quickly called and flipped over his cards showing [ad][as] and said, "Let's do this!" The player in middle position turned over [kh][kd]. The board ran out [qd][10h][5c][3s][8s], awarding Saleba a full double up. He is now sitting just shy of 800,000. There were a total of 296 runners in today's World Poker Finals Event #4. At the present moment there are 140 players remaining in Level 14 (1,000/2,000 blinds with a 300 ante). On a board reading [9h][7s][3h][6c], a player in early position shoved all in and Venkatara Ganne called. The river came the [10s]. Ganne's two pair took down the hand and eliminated his opponent from play. On a board reading [8h][7s][3h][kc], Dave Stefanski check-called a bet of 38,000 from a player in middle position. Stefanski again checked when the [5c] came on the river. His opponent bet 82,000, and Stefanski went into the tank. After a moment of thinking it over, he opted to make the call. His opponent turned over [5h][5s] having rivered a set of fives, and Stefanski mucked his cards. Stefanski is now playing 300,000. The remaining 85 players in Event 1, Day 2 are now on their first 15 minute break of the day. Play will resume at Level 20 (4,000/8,000 blind with a 1,000 ante). When the flop came [kc][9s][8d] it checked around to Jesse Kosko in the cutoff who bet 18,000. Jeffrey Miller called in the big blind, and a player in middle position folded. The turn came the [ks]. Miller checked, Kosko bet 20,000, and Miller called. When the river came the [2d], Miller led out for 45,000. Kosko went into the tank and after a minute or two, pushed a few stacks of chips forward to make the call. "You're good," Miller announced as he turned over [qs][jc]. Kosko turned over [ah][7h] for ace high and the winning hand. A player at the table that wasn't involved in the hand said, "Nice call, man." Kosko is now sitting with around 380,000 in chips. On a board reading [10s][5c][2d][10d][5h], Raymond Jones in the cutoff shoved all in for 6,550. The player on the button went into the tank for a solid two minutes. He shifted back and forth in his chair and after staring Jones down, eventually threw in a chip to make the call. Jones turned over [kd][10c]. Seeing he was behind, the player on the button showed [5d][3d] and then threw his cards into the muck. A player not involved in the hand then told the FoxwoodsPoker.com Blog that Jones had lost the previous hand when he got his aces cracked, and that this hand was him"bouncing back." There are currently 161 runners in Event #4. All players started with 30,000 in chips and will play 20 minute blind levels. Registration for this event is open until the start of level 11. They are currently playing level 3 (75/150 blinds). Cards are in the air for Day 2 of Event #1 $600 NLH. 142 players remain, and all remaining players are officially in the money and guaranteed a min cash of $1,208. For official payouts please see this link.